Charming. Clever. Romantic. Enchanted features that odd, grim, slightly horrific quality that the original fairy tales often have, but Kontis’ magical tale is dosed with a good deal of humor, beauty and strong familial bonds. Perhaps my favorite part of this story was how Kontis has seamlessly interwoven many, many beloved stories into that of her Woodcutter family. It never felt as though those details were tagged on. Those details never became tiresome or felt awkwardly included. Instead the way the story was written, I could almost believe that all of the fairy tales I know and love were in fact inspired by this one very large and diverse family. The romance between Sunday and Prince Rumbold, is extremely adorable – a little on the sappy side, at times, but I found I didn’t mind all that much. Sunday is a lovely character, a girl whose optimism and excitement is infectious. A girl inspired by stories, and who has a way with words. She’s tough, but sweet. A dreamer, yet practical. She’s suffered tragedy, and yet she’s still a romantic. She’s innocent, but not naïve. Rumbold, on the other hand, spends most of the book a fish out of water, or more accurately, a frog out of the forest. He spends much of the book trying to remember exactly who he was and discovering who he now wants to be. He’s definitely angsty, but he’s kind, brave and good. So I’m inclined to forgive the angst seeing as he was, only recently a frog… and that’s a bit of a raw deal. In any case, Sunday & Rumbold compliment each other well, and it’s fun watching their fairy tale unfold. Bit of a side note… the narrator of the audiobook, Katherine Kellgren, is absolutely fantastic. Her tone, her inflections, her voices, her entire performance is perfect, demonstrating yet again that a narrator can either make or break a book. Overall, if you love re-imagined fairy tales with a bit of old and new, if you looking for a sweet romance, if you’re ready to fall for a heroine who’s both sweet and sassy, you should definitely pick up Enchanted. Teehee… Ms. Kellgren is rather amazing, but then, so are you! 😉 Cannot wait to read more of the sisters’ stories. Thanks so much for stopping by the blog and reading my review! I lovethis new audiobook streak of yours, Dani! This way I get tons of new recs that take into account both the story and the voice acting… which, yes, is VITAL! lol… it’s actually an old streak that I’m reviving. And yes… the narrator is extremely important… which may account for some of the reason I didn’t like Finnikin of the Rock as much as I could have. But this book is just really cute and I hope you enjoy this one, Ron! This sounds like such a cute read. I love fairy-tale retellings. Thanks for the review. It sounds like audiobook is the way to go for this story! Oh it’s super cute, and the narrator really just takes the book up a whole extra notch Thanks for stopping by Kris! Oh~ how I love fairy tale retellings. This sounds sweet and I definitely plan to pick it up. The question now is in what format? I’ve never tried an audiobook before (only what I hear on am radio sometimes) and I wonder if I’d enjoy them the more I see people picking them up! Yay! This book would good no matter what format you pick it up in. I just happen to do a lot of driving and have a lot of computer busy work that lends itself nicely to listening to audiobooks. I hope you get to read this soon! I loved Enchanted. I really, really did. I was worried that it would be a little on the silly side for me, and it really was! But I loved every single second of it! 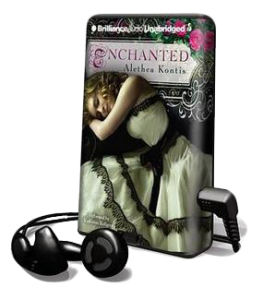 I have never listened to an audio book before, but I think Enchanted would be a fun one to listen to. It was a little on the silly side, but like you said, it worked for me and just made it irresistibly cute And yeah, the narrator of the audiobook is seriously perfection. When I saw the book I was hesitant to read it, after I read your review, I’m not so hesitant. And I love fairytales so this seems awesome! Yay! It’s a super cute book and I hope you get to pick it up soon! I really enjoyed reading Enchanted. It has so many fairytales interwoven throughout the story. It really is a very clever and fun book. Yay! I’m so glad you thought so too! Thanks for dropping in Sandra!